DESCRIPTION Spurred on by the great success of our smooth Corrado scuttle panel we thought it was about time to treat the mk2 Golf to the same treatment. It’s been a long time in the making but this new Mk2 Golf scuttle panel from SWG Motorsport was well worth the wait. This brand new design replaces the old and fragile 2 piece original plastic scuttle with a smooth 1 piece item that fits across the entire bay from wing to wing, giving increased protection from the elements and completely covering the ECU , heater fan and wiper motor. Unlike a few other basic designs that were kicking around a few years ago (that were just a flat piece of plastic) , this unique SWG panel is specially sculptured in one piece to the contours of the Mk2 bay. It utilises existing mounting points (no drilling) and comes complete with bespoke brackets, stainless fittings and rubber edging etc. 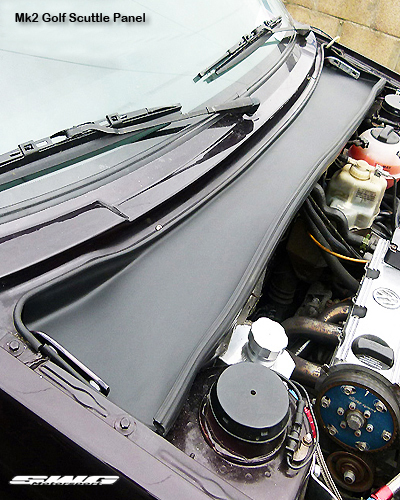 Designed to fit all Mk2 Golf and Jetta models (RHD and LHD models from 1984 – 1991) Its unique smooth 1 piece design is an ideal finishing touch to any Mk2 engine bay. Supplied in an OE style Matt black finish ready to fit.